So far Gabriela Siqueiros has created 79 blog entries. With two days of touring behind them, Feather editors and adviser Greg Stobbe pose in from of the Freedom Tower in NYC before they visit the 9-11 Memorial Museum, March 19. With two full days in New York under their belts, the editors prepared themselves for their third full day in the city. One more day and the team will spend the rest of the week at Columbia University for the Columbia Scholastic Press Association’s 91st convention. Warm clothes were strongly suggested and the group departed from the hotel at 9:30 a.m to take the subway as FC hits NY and visit the 9/11 Memorial. The 9-11 Memorial has been in the stages of construction since 2007 and is still being added to. The highlight of the site was the museum dedicated to honoring those who lost their lives and their loved ones. After the memorial, the editors made their way down Wall Street and popped in to the Trinity Church. Following the cathedral the group made their way to Battery Park where they watched street dancers perform and viewed the Statue of Liberty from afar. From there, the girls made their way back to Times Square to shop freely and the boys took a trip to Grand Central Station before returning back to Times Square to shop. The group met up at 7:45 p.m. to make their way to the 8 p.m. Broadway showing of An American in Paris and ate a late dinner at TGI Fridays. First timer in New York City, Trevor Beal, shares his impressions of the city along with his favorite aspects of the trip. Chloe Mueller, Editor-in-Chief, says she will enjoy giving a session at the 91st CSPA Journalism Convention at Columbia University. This writer can be reached via Twitter: @gaby_siqueros. For more news, read the March 18 article, FC hits NY: Day 2 (SLIDESHOW, VIDEO). Over 10 different speakers gave presentations on career choices and how to begin preparations for them in the 4th annual Career Fair, March 11. In hopes of better educating campus students on different career paths, FC hosted the 4th annual career fair, March 11. Students attended three sessions throughout the afternoon followed by a meet and greet in the court yard. The session included a variety of different speakers such as ABC 30 reporter Amanda Venegas, ultrasound technician Robyn Hill, superintendent Jeremy Brown, Engineering student Danielle St. Marie, NASA project manager Suzy Dodd, nurse Laura Sherfield, speech pathologist Christie Edmondson, Detective David Fries, CEO of High Tech Homes Jay Cobb, veterinarian Todd Conlan, occupational therapist Dorothy Siqueiros, and senior gas estimator Scott Belmont. Aspiring engineer Breanna Jennings, ’15, says that she learned about the educational requirements and qualities an engineer should possess. 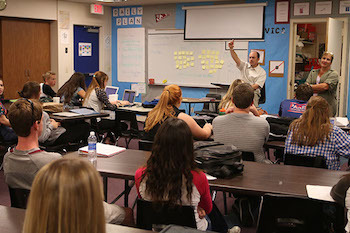 Venegas gave a session and Claire Kollenkark, ’16, looks forward to career day every year. Occupational Therapist Dorothy Siqueiros urges students to get a jump start on their career and connect with other people for the best educational and financial options available. Laura Sherfield, a nurse at Valley Children’s Hospital gives her advice to teens and insight on how her passion for nursing began. CEO of Forward Advantage Chris Roggenstein is happy with the diversity and serving opportunities the annual career day holds. Senior PG&E gas estimator Scott Belmont comments on the success that hard work and dedication could potentially bring to your career. Freshman Celeste Counts shared that she was drawn to the veterinarian in particular, due to her own interests in the trade. This writer can be reached via Twitter: @gaby_siqueiros. (Scrimmages do not count toward win/loss record. Visit the Sports Section for girls’ soccer features). For a simple overview of scores and upcoming games, check the Winter sport box scores, 2014-15, for dates, opponents and times for all Eagle sports. 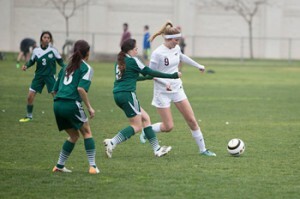 The Eagles hosted Frazier Mountain but were defeated by the Falcons, 2-0, losing the Valley Championship, Feb. 24. 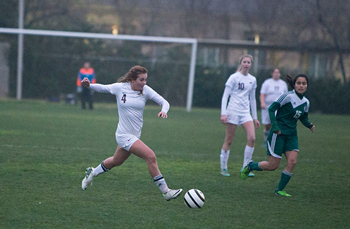 Be sure to visit the 2014-15 girls’ soccer schedule, home page, or check out Maxpreps.com. FC is currently 4-5 in the West Sequoia League and 11-9 overall as of Feb. 24. The Frazier Mountain Falcons traveled to the FC field to play in the first Valley Championship game since 2004 and the first ever championship hosted at home for the Eagles. However, the home team could not contain the visitors and lost, 2-0, in the Valley Championship, Feb. 24. Anticipation for the game had been building up all day at school and rolled over into the warm ups. The Eagles watched as the stands quickly filled up with familiar faces. The girls rallied together to pump each other up and remind one another to give their all as this would be their last game of the season, and some of their career. After all the pre-game festivities the game finally began. The Eagles were the first to make an advance on the Falcon defense but were quickly reciprocated and pressured the Eagle defense. About halfway through the first half, the FC goalkeeper slid outside the box in order to block a goal resulting in a penalty kick. The kick went in allowing the Falcons a 1-0 lead which quickly turned into 2-0 when a forward broke through the Eagle defense and barely scored yet another goal. As halftime came around the Eagles communicated with each other to improve the quality of the game and encourage the team to fight back. The defense did not allow the Falcons to score again, however the offense simply could not string any passes together to get past the defensive line and the final score remained 2-0. Freshmen Olivia Messer, one of the top scorers on the team is dissapointed in the way the team played and is under pressure to do well next year. Senior Mikayla Miller, feels proud of the team for making it so far and is happy with her last season despite the tough loss. The game was recorded by the CIF Central Section Network. For more sports, read the Feb 25 article, World of Sports: NBA vs NCAA. 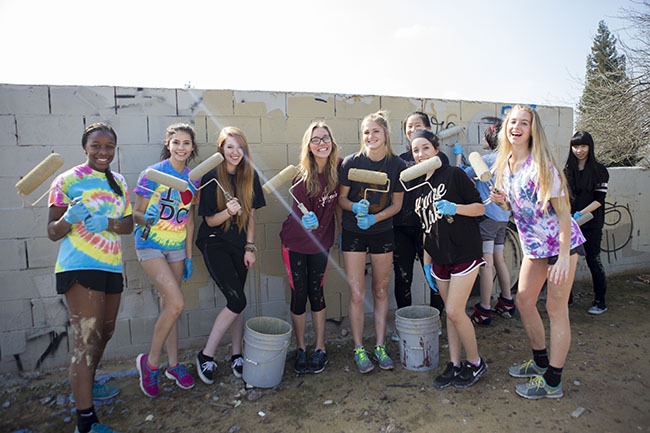 The second school-wide Serve Day rallies the whole campus to volunteer in multiple places across the city including painting over graffiti near railroad tracks, Feb. 19. The second annual school-wide serve day took place, Feb. 19. Students signed up for their location of choice earlier in the week during chapel and prayed to leave a positive impact on the community. The different service sites include: the Community Food Bank, Poverello House, park clean up, Neighborhood Thrift, two graffiti clean up sites, connecting with students at Kepler Elementary School and a yard work group. The students were assigned their chaperones and buses after a rally like chapel and were encouraged to serve with a joyful heart and spread the love of Christ. Leadership advisor Vickey Belmont gives insight into the second annual FC serve day. Freshman Erin Wilson found serve day to be much more rewarding than she had originally thought. Sophomore Julian Castro helped clean up an elderly man’s yard with his friends and enjoyed shining the light of Christ to him and others. “We mowed his lawn, picked up piles of leaves, and picked up logs and branches from his property. To be honest I had a really great time, even though im not one to enjoy yardwork I found myself workng hard and having fun,” Castro said. “I do feel like we made an impact on his life because it makes him feel better when he looks out his window and sees a freshly cleaned yard. I think it’s the least we could do for him. Junior Maddie Luginbill was in the graffiti clean up group and found that serving with friends makes the ward work fun and worth it. For more features, read the Feb. 24 article, Speaker educates on body language, power of communication. 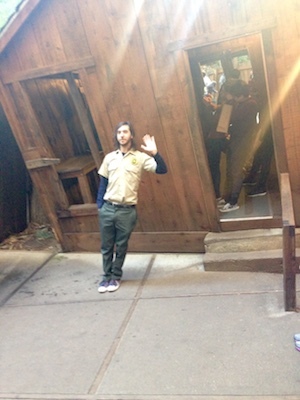 The Mystery Spot is a destination that has both puzzled and amazed its visitors for 75 years. The attraction is centered around a gravitational anomaly in the forest near Santa Cruz, California with tours beginning in 1940. The Mystery Spot is something that has both puzzled and amazed its visitors for 75 years. The attraction is centered around a gravitational anomaly in the forest near Santa Cruz, California. Tours began in 1940 and have remained successful since, the Mystery Spot is a circular area of 150 feet that questions the laws of physics and gravity. A small cabin was built to enhance the effects the Spot has on it’s visitors. The short hike to the cabin proves to be about three times harder than one would expect. This is occurs because the closer one gets to the center, the harder gravity will push them out. Once the uphill climb is over you look down and realize you can see your feet much farther in front of you than usual. The tour guide then goes on to place a wooden board on the window sill of the house, clearly slanted down. He placed a pool ball in the center and to everyone’s amazement rolled up instead of down. Once inside the cabin there is a lead ball that is much easier to push one way than the other and handles to hang from that display a slanted hang rather than straight up and down. Once entering the cabin all sense of balance and depth perception were challenged. Merely walking from one room to the other proved to be quite the struggle especially considering the ease our tour guide displayed. There were multiple interactive displays built into the cabin to demonstrate the effects of gravity in the mystery spot on human bodies. After touring the cabin, a final demonstration was performed. Volunteers stood on a log from shortest to tallest and then vice versa, and the effects were buzz worthy. Once the shortest and the tallest person switched positions the shorter person then appeared taller than the tallest man. Each patron received a free Mystery Spot bumper sticker. From the Santa Cruz Beach Boardwalk it was a quick 13 minute drive. Admission is $6 per person, and $5 for vehicle parking. I was very happy with the pricing and experience I received. The tour guides were very experienced and capable of captivating an audience for the entirety of the tour. This writer can be reached via Twitter: @namoodnhoj. For more reviews, read the Jan. 9 article, Featured app: Octagon. 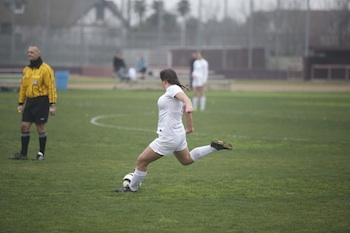 The FC girls soccer team travel to Parlier to face the Panthers to play what is supposed to be a ‘winnable’ game. Be sure to visit the 2014-15 girls’ soccer schedule, home page, or check out Mapreps.com. FC is currently 1-2 in the West Sequoia League and overall 7-5 as of Jan. 22. The Parlier Panthers traveled to the FC field to play what was supposed to be a ‘winnable’ game, however it did not go as planned. With the Panthers starting the first half with ball, the Eagles were determined to gain possession quick and maintain it for the majority of the match. However the Eagles simply were unable to make any shots on goal and lacked manpower up top. Even after the half time pep talk, the Eagles found themselves struggling against the Panthers. Both teams became frantic and desperate for a goal as the half continued to drag on. Neither team was able to score, thus leading in to overtime. The Eagles managed to hold the Panthers off for the majority of the half, but were scored on by a kick just outside the 18. The second half of overtime was uneventful for both teams and the Panthers took home the win. Junior captain and center mid fielder, Courtney Messer explains what she could have done better for her team. Senior defender Breanna Jennings is disappointed in the team and their performance against the Panthers. For more sports, read the Jan. 16 article, Boys soccer sport short: Fowler. The FC Eagles face the Riverdale Cowgirls and are ready to put up a fight. The Riverdale Cowgirls stepped up their game this year defeating the once undefeated Caruthers Blue Raiders and dominating almost every match they’ve played this year. The Eagles were prepared to fight till the end no matter what the outcome. Eagles started off the first half with ball, making a good run on the starting play. About ten minutes into the half the Cowgirls scored on a corner kick, only to be countered with a goal by FC (with the help of one of the Riverdale defenders) just a few minutes later. Both teams continued to play hard yet were unable to score for the rest of the half. The Cowgirls started the second half strong and managed a few good runs against FC. Defender Morgan Koop scored the second goal for the Eagles midway through the second half. The Cowgirls retaliated and began playing rougher now desperate for a goal, and they managed a goal in the last few minutes of the half. The first half of overtime set the tone for the rest of the game, both teams were neck and neck with one another. Elbows were plying, players were shoving, and parents were screaming. Although neither team scored in the first half the behavior of the parents and players intensified and carried on to the second half of overtime. With nerves running high and time running out the game quickened in pace and aggressiveness. About halfway through the half, Olivia Messer scored on the Cowgirls with the cross from Gabriela Siqueiros. Thus ending the game and silencing the Cowgirls. 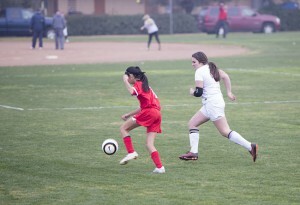 Freshmen and striker Olivia Messer was excstatic with the win and part which she was able to play in the team. Follow The Feather via Twitter @thefeather and Instagram @thefeatheronline. This writer can be reached via Twitter: @gaby_siqueiros. 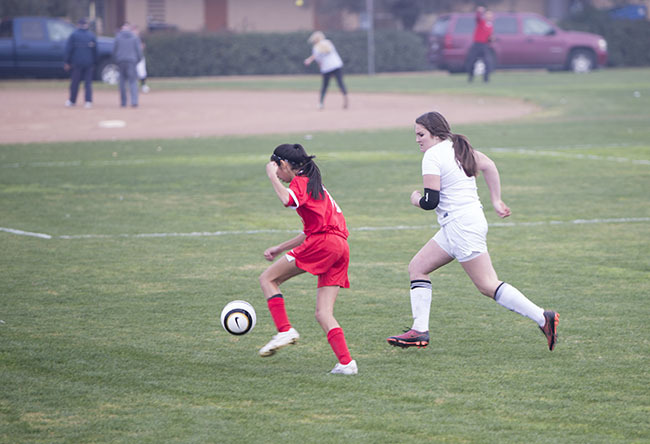 Friday is a busy day in terms of athletics, every winter sports team plays at Minarets High school and the girl’s soccer team has the pleasure of kicking off the evening. Be sure to visit the 2014-15 girls’ soccer schedule, home page, or check out Mapreps.com. FC is currently 1-3 in the West Sequoia League and overall 7-6 as of Jan. 28. Friday was a busy day in terms of athletics, every winter sports team played at Minarets High school and the girl’s soccer team had the pleasure of kicking off the evening. The Eagles came out dry and seemingly unmotivated to play. Their level of intensity was low and the lack of focus was evident throughout the course of the game. The Eagles managed a few shots on goal, but none even remotely successful. Even starting off with the ball in the second half, the Eagles started the second half with a lack of effort. It seemed as if the whole team was having a bad day in terms of skill. It wasn’t until the last 20 minutes of the game that the girls picked up their game and gained some momentum. Olivia Messer scored the first and only goal for the Eagles, and the Eagles just barely managed a win against the lady Mustangs. Freshmen forward Olivia Messer is pleased with her goal but admits that the team played lazy and unfocused. “As a team we really need to communicate more and pass because Minarets was passing around us a lot,” Messer said. “We weren’t focused and our heads weren’t in the game and we were all over the place. Senior defender Mikayla Miller is disappointed in the performance of the team compared to years past. The Eagles wills will next play at home against the Parlier Panthers, Jan. 20 at 3:30 pm. Varsity girls soccer face off against the Fowler Redcats for their first home game of the season. The Eagles hosted the Fowler Redcats at home for the first league game of the season. Both teams have been equally matched in the past, and the game was one to be anticipated. Both teams came out with the same level of intensity and determination. The Eagles were the first to take shots on goal, but were shut down soon after. As the half went on the Eagles dwindled down to a state of survival as the Wildcats amped up their game. Starting off the second half, the Eagles came out ready to put up more of a fight and battle for the win. The Eagle defense was stronger than ever against the powerhouse Wildcats and held them off for the rest of regular time. Overtime started with both teams feeling pressured and desperate for a goal. The Wildcats managed a shot which was accidentally kicked in by an FC defender due to lack of communication. As the second half commenced the Eagles fought hard and never gave up, yet despite their efforts were unable to score. Recently injured senior and co-captain, Ivette Ibarra, expresses her mixed feelings about the game. Head Coach Tony Martinez believes the girls did not play to their potential but stayed in the game no matter what. The Eagles wills will next play away versus the Minarets Mustangs, Jan. 16 at 3 pm. (Scrimmages do not count toward win/loss record. Visit the Sports section for girls’ soccer features). For a simple overview of scores and upcoming games, check the Winter sport box scores, 2013-14, for dates, opponents and times for all Eagle sports. Be sure to visit the 2014-15 girls and boys soccer schedule, home page, or check out Mapreps.com. FC is currently 0-0 in the West Sequoia League and overall 5-4 as of Dec. 19-20. The Garces Holiday Soccer Festival is the largest high school soccer tournament in the world. Both the FC boys and girl’s teams participated in the tournament in the silver B division. The girl’s first opponent was Delano high school, a team the Eagles had fallen to in the past. The Lady Eagles came out with fire and intensity as the first game was crucial if they wished to compete for a trophy. FC came out with the win 2-0 with goals scored by Olivia Messer and Gaby Siqueiros. 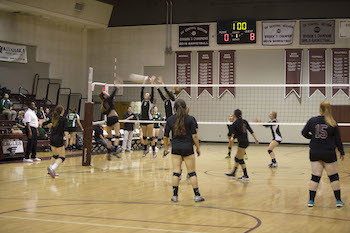 The second day of the tournament the girls faced Centennial JV, a Division I JV team. In order to qualify better than third the Eagles needed to win. Centennial scored the first goal only for the Eagles to counter it by a goal made by Siqueiros. 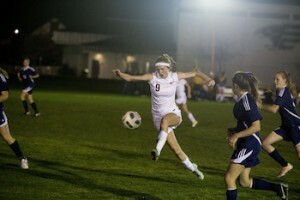 The Eagles then went in to overtime and eventually penalty kicks, however the Eagles were unable to pull out the win. The Eagles final competition was against Kennedy high school for the third place trophy. The Eagles were prepared for a battle, only to win the game with ease. FC won 3-0 with goals from Jenna Bynum, Olivia Messer and MorgMorgan Koopan Koop. Similar to the girls, the boys came out ready and eager for a fight, facing a familiar opponent, the Kern Valley Broncs. The Eagles carried possesion of the ball for a majority of the game. Scoring with multi-schooler Davis Borrego, Nick Fontes, and strikers Taylor Howard and Joshua Carter, ending the game, 4-0. On the second day of the tourney, FC faced a difficult opponent, the Nipomo Titans. The game started off even, yet the Titans pulled ahead because of a lapse within the defense. The Titans scored once again in the second, due to silly mistakes which cost the Eagles dearly. Ending the game with the Eagles now in the fight for third place and Nipomo fighting for first. The third and final game was against the Gridley Bulldogs. Both teams were tired yet the Eagles had managed to accumulate a multitude of injuries, adding another obstacle to earning a win. The game remained scoreless for a majority of the first half yet the Bulldogs managed to score just before halftime. Due to numerous injuries, the Eagles were forced to sub out several starters and pull the remaining starters into defensive positions. Making a win far from their grasp and in the end, letting go another point and losing once again, 2-0. Placing the Eagles in 4th place, just out of reach of a trophy. For all scores from the Garces Holiday soccer tournament check out the Garces tournament homepage. The purpose of the festivus was to add a social event for FC students during the first semester and allow students to fellowship openly in a different environment. 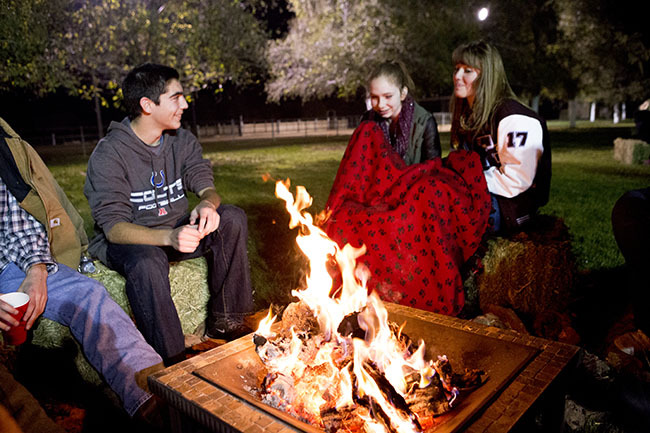 The 2nd annual Fall Festivus took place at the Beal ranch, Nov. 25. The purpose of the festivus was to add a social event for FC students during the first semester and allow students to fellowship openly in a different environment. With nearly 70 students attending there was a variety of activities to participate in. Various camp fires were set up for students to warm up by. There was a food bar with hot dogs, popcorn, s’mores, pie, coffee, candy and hot cocoa. The highlight of the evening was the showing of Nacho Libre on a blow up screen and a viewing area for all those who wished to watch. Senior Breanna Jennings enjoys the atmosphere the festivus provides the FC community. 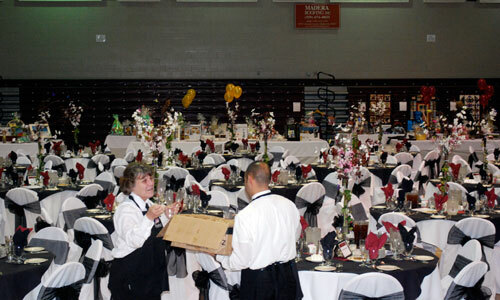 FC leadership was in charge of providing all the food, drinks, activities and supplies to make the night a success. Leadership advisor Vickey Belmont believes the class met the standard of the attending students. Freshmen Roman Endicott enjoyed his time at the festivus and is grateful for the memories he made at the event. “I thought the whole experience was great and it was just really nice to be able to hang out with my friends right before the break and just have a ice kick off towards thanksgiving and end the last day on a good note,” Endicott said. Alyssa Oakley, ’15, enjoyed the simplicity and quaintness the festivus provided. With no organized games, the festivus allowed students to do what they pleased create their own fun. To honor athletes for their hard work and achievements, the annual Winter Sports Banquet was held in the Student Ministry Center. Attendees included girls tennis, volleyball, football, cross country and parents of the athletes. Winter sport coaches handed out participation certificates and varsity patch. In addition coaches also handed out individual awards to deserving athletes. Co-Athletic Director Jonathan Penberthy started of the evening with a word of prayer and allowing everyone to serve themselves to the table of desserts and drinks. Following the food, the cross country team was asked on stage to begin the ceremony. After cross country the teams go as follows: cross country, girl’s tennis, JV volleyball, varsity volleyball and football. Co-Athletic Director Mick Fuller, provides further insight on the event and it’s purpose. For more features, read the Nov. 21 article, Jack Leonard: A veterans perspective (PODCAST). For a preview to the Eagles volleyball season and a look at their scores so far, check out the Fall sport box scores, 2014, for dates, scores, and all fall sports. Also, please be sure to check out the Eagles’ schedule for the upcoming season at Max Preps. FC is currently 14-12 overall and 8-2 in the Central Sierra League as of Nov. 13. FC hosted the Immanuel Eagles Nov. 13 in their first playoff game of the season. FC vs Immanuel Eagles, Nov. 13. In the first set, both teams came out loud and pumped hoping to start strong and confident. FC dig a small hole in the first rotation of serve receive, but managed to gain a momentum towards the middle of the set. It was then the senior Ivette Ibarra sprained her ankle which would keep her out of the game for the rest of the night. Immanuel won the first set, 25-13. FC’s dynamic suffered greatly due to the confusion of the new players and lack of a strong middle hitter and passer. FC did the best they could in their predicament, however they could not manage to gain any runs or any momentum, thus losing the second set, 25-15. With spirits low, FC came out for the third set hoping to pull it together and make something happen. Immanuel countered all the FC efforts and finished off the set and match, 25-16. 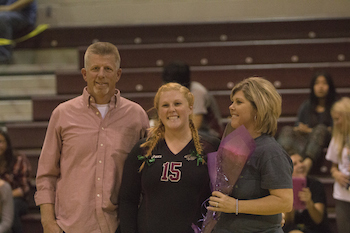 Senior Ashley Garcia bids volleyball goodbye and is thankful for the people that made it memorable. Senior Ivette Ibarra was disappointed to be injured during the game. For more sports, read the Nov. 3 article, Football sport short: Northwest Christian. Also, please be sure to check out the Eagles’ schedule for the upcoming season at Max Preps. FC is currently 14-13 overall and 8-2 in the Central Sierra League as of Nov. 6. FC’s next game will be on Nov. 10, in which the Eagles will host Immanuel once again. FC took a trip to play the Riverdale Cowgirls, Nov. 6, hoping for redemption from their last encounter. FC loses 3-2 to the Riverdale Cowgirls, Nov. 6. In the first set, starting off with serve receive, the Eagles began shaky and trailing by several points. Unable to recover, the Eagles lost, 25-20. Starting off with the serve, the Eagles started off with a comfortable lead and kept with it for the majority of the set, overpowering the Cowgirls, 25-17. In the third set the Eagles came out with increased confidence and intensity pulling out another win, 26-24. With only one more game to win, the Eagles were intent on battling and finishing it off. However the Cowgirls were prepared to win the set and go to a fifth game. The Eagles held a slight lead for the majority of the game, but the Cowgirls pushed until both teams were tied and continued to battle until the Cowgirls finally won by two, 29-27. The Eagles, fired up from the competition came out swinging, the Cowgirls responded with accurate defense. The Cowgirls managed a lead that they kept to finish off the match, 16-14. Sophomore Hannah Nale is disappointed with the teams loss and looks forward to playing them next year. Head coach Johnathan Penberthy saw the game as a chance for improvement. FC volleyball competes against the Parlier Panthers for their second league game of the season. 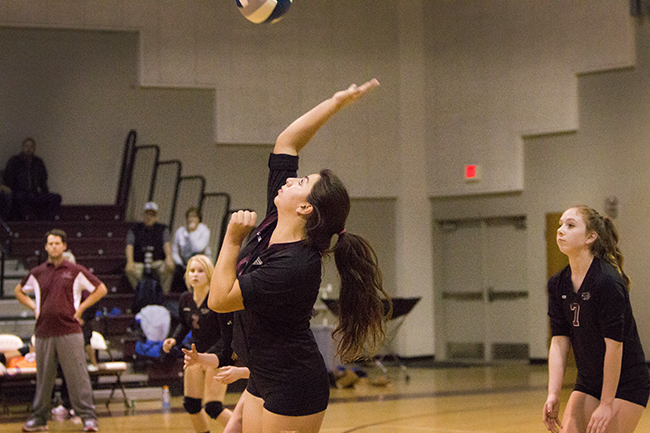 For a preview to the Eagles volleyball season and a look at their scores so far, check out the Fall sport box scores, 2014, for dates, scores and all fall sports. Also, please be sure to check out the Eagles’ schedule for the upcoming season at Max Preps. FC is currently 14-12 overall and 2-7 in the Central Sierra League as of Nov. 4. FC’s next game will be on Nov. 6, as the Eagles visit the Riverdale Cowgirls. FC visited the Parlier Panthers and clinched their second league game. In the first set the Eagles came out confident and ready to have fun, as the set progressed, the Eagles began to lose focus however they still won, 25-19. In the second set the Eagles continued to unwind, losing focus and intensity. The Panthers took the opportunity to run points off the Eagles who still managed to conquer 25-20. Hoping to get a win on their senior night, the Panthers were fired up and ready to battle. Despite their efforts the Eagles focused in and silenced the Panthers, 25-12. Ending the game 3-0 Eagles. Head coach John Penberthy believes the team needs to put forth more effort in the easy games. 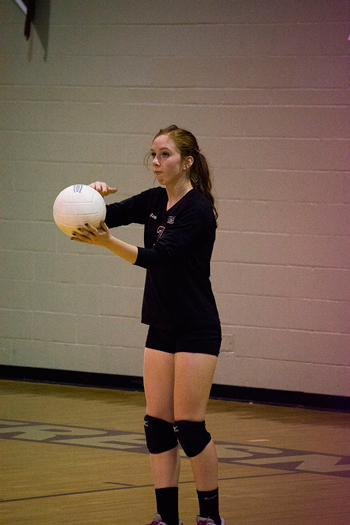 Sophomore Jennifer King finds that the team disspoints when they play easier teams. The Eagles girls volleyball team will next face the Riverdale Cowgirls. Follow The Feather via Twitter: @thefeather. This writer can be reached via Twitter: @gaby_siqueiros. FC hosted the Minaret Mustangs for their senior night, Oct. 30, hoping play their hardest and compete with the powerhouse Mustangs. Also, please be sure to check out the Eagles’ schedule for the upcoming season at Max Preps. FC is currently 13-12 overall and 1-7 in the Central Sierra League as of Oct. 30. FC’s next game will be on Nov. 4, as the Eagles visit the Parlier Panthers. In the first set the Eagles came out hoping to find their rhythm and learn the player’s patterns, however, the Mustang momentum could not be stopped and the set was lost 25-16. With patterns identified and one set behind them, the Eagles came out ready to fight hard. Despite the adjusted defense and dedication, the Mustang offense was clean and well executed, winning them the set ,25-11. In the third set the Eagles came out with passion and intensity hoping to go out with a bang despite the misfortune of the previous two sets. The Eagles adjusted their defense to the Mustang offense and played their best set of the match. However, still losing to the back to back Valley Champions, 25-17. Senior Ivette Ibarra, is disappointed in losing the match but is happy to have played with passion in her last home game. Senior Ashley Garcia, has mixed emotions about her final game in the FC gym. Senior Breanna Jennings, is thankful for having the opportunity to play with her friends and will cherish the memories forever. Senior Gabriela Siqueiros, is grateful for having the opportunity to play with her friends for so long and watching everyone grow in their skills and abilities. Gabriela Siqueiros, Features Editor, also contributed to this article. Also, please be sure to check out the Eagles’ schedule for the upcoming season at Max Preps. FC is currently 14-9 overall and 1-5 in the Central Sierra League as of Oct. 28. FC’s next game will be on Oct. 30, as the Eagles play at home against the Minarets Mustangs for senior night. FC traveled to Fowler High School, Oct. 28, hoping to gain their second league win. The Redcats played short a few of their starters in the first set, the Eagles took advantage and won the set, 25-19. With their whole team playing, the Eagles faced a larger challenge than they had anticipated. The Redcats took the Eagles by surprise winning the set, 25-8. The Eagles stepped it up and played with increased intensity and power in the third set, however still losing the match 25-23. It was do or die for the Eagles in the fourth set, starting off behind, the Eagles came back and managed a lead. Soon after the Redcats responded with a few good runs and gained the lead late into the set. The Eagles were unable to come back, losing the set, 25-21 and the match ended 3-1. Senior Ashley Garcia is disappointed that they lost, but believes they played hard and gave them a run for their money. Head coach John Penberthy believes the team could have cut down on their errors and capitalized on the runs they got. To kick off a week of pageants, the princesses participated in a game show event with the rest of the high school as their audience, Oct. 28. Macy Mascareñas, ’16, receives a pie to the face from Ashley Garcia, ’15. The 30th annual homecoming candidates were introduced by means of slideshow with photos from their formal introductory shoot. The candidates form each class made their way to the tables on stage to begin the game. A Jeopardy board was displayed on screens for every one to see with several categories to choose from. The questions were intended to familiarize the audience with the candidates. The object of the game was for the candidates to answer the question correctly and earning points for their team. However if the question was answered incorrectly the princesses were forced to pick from a hat of consequences to perform. Senior and first time queen nominee Callista Fries helped out with the princess pageant and enjoyed being able to inflict the consequences on the princesses. Fries will be participating in the queen pageant, Oct. 29. First time nominee Claire Kollenkark, ’16, is happy with the class participation and the overall atmosphere of the pageant. Kollenkark also felt more comfortable because she was surrounded by two close friends. Freshmen princess nominee Erin Wilson anticipated much worse but was very happy with her very first princess pageant. Wilson looks forward to watch the upcoming pageants with the queen and king participants. Senior and king nominee Jordan Castro is happy with the way the pageant was planned and believes there was more purpose behind it. Sophomore Elizabeth Baker felt that the pageant built a sense of community amongst the members of the campus. The Queen Pageant will be held in the Student Ministries Center from 2:25-3 p.m., Oct. 29. The King Pageant will also be held in the Student Ministries Center from 9:35-10:10 a.m., Oct. 30. The 30th annual homecoming game will take place on the North Field at 7 p.m. The pre-game events will start at 6:30 p.m. where the princess candidates will be introduced. At half-time of the varsity game, the winners will be announced for all the homecoming court nominees. For more features, read the Oct. 24 article, Character counts week raises awareness to teens around the country. Homecoming is considered by many to be the single most action-packed week in the FC school year. There are dress up days everyday, three pageants, a blood drive, a rally, football game and four floats. There is no way to avoid the mayhem; so why not be a part of it? In the past few years FC has seen a drop in school spirit. Teachers and the leadership class have tried their best to get students involved by offering extra credit if students attend sporting events and by planning various events to spark student interest. Despite the efforts of the faculty and leadership class, the decision still lies with the student body. The sole purpose for homecoming week festivities is to build up for the Friday football game. Now, I know football is not everybody’s thing, but as cliche as this is going to sound, you only experience high school once. Now, I know some people are dying to finally get out of high school and get to actually living life. However, take a look; this is life, and later on when your kids ask about your time in high school do you want to be able to earn some cool mom/dad points by showing them super embarrassing pictures and having stories to go along with them? Whether we like it or not, the time is now to start making those timeless memories about how ridiculous you dressed up, how you beat your rival class in a screaming match at the rally or how you completely lost your voice at the football game even though you have absolutely no idea what’s going on. Don’t waste your time watching other people have fun. Join in, influence other people, create the memories you deserve to leave high school with. Do not put all your effort into abstaining from this week because you are afraid of what people will think. If you have already made it clear you think it’s all a waste of time but you’re having second thoughts, then who cares. It’s okay to change your mind; those who mind do not matter, and those who matter do not mind. For more opinions, read the Oct. 24, COLUMN: Invitation to homecoming. Also, please be sure to check out the Eagles’ schedule for the upcoming season at Max Preps. FC is currently 13-9 CHANGE overall and 1-4 CHANGE in the Central Sierra League as of Oct. 23. FC’s next game will be on Oct. 28, as the Eagles play away against Fowler High School. FC hosted the Caruthers Blue Raiders at home, Oct. 23, seeking redemption after their previous loss to the Blue Raiders, Oct. 7. In the first set the Eagles managed to keep a safe lead from the Blue Raiders for the entirety of the game, thus winning, 25-22. 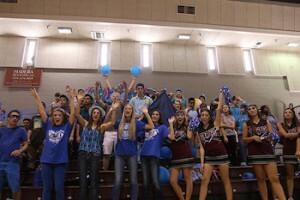 In the second set, the Blue Raiders fought back with force and beat the Eagles 25-12. With both teams equally matched and tied, the Eagles shaped up and blasted the Blue Raiders, winning 25-18. In the fourth set, both teams played with high intensity in hopes of either winning the match or getting another chance in the fifth set. In a valiant effort, the Eagles lost 25-20. In the fifth and final set both teams walked on to the court ready to do whatever it took to win the match and be named number one in division five. The Eagles got off to a slow start but began to step up their game quickly. However the Blue Raiders kept their lead and left the FC gym victorious, 15-11. Sophomore Hannah Nale is disappointed that the Eagles lost, however believes they played very well. Head coach John Penberthy I proud of the way the girls played and happy with the student section. Also, please be sure to check out the Eagles’ schedule for the upcoming season at Max Preps. FC is currently 13-9 overall and 1-4 in the Central Sierra League as of Oct. 21. FC’s next game will be on Oct. 23, as the Eagles play a home game against Caruthers High School. FC hosted the Riverdale Cowgirls at home Oct. 21, hoping to win their second league game of the year. With one league win under their belts the Eagles came out with confidence and fire in the first set, conquering 25-12. In the second set, the Eagles lost some of their edge and focus yet still managed to maintain the lead, 28-26. The Cowgirls gained tremendous amount of momentum in the third set and fought hard to beat the Eagles, 25-14. Still ahead, the Eagles came out flat and were unable to find a foothold losing, 25-16. In the fifth and final set, the Eagles were clearly ready to fight, both teams were neck and neck with each other for the majority of the set. However the Eagles still could not manage to stand their ground against the Cowgirls losing the set 15-13 and the match 3-2. Senior Ashley Garcia is disappointed by the loss but hopes that the team learns from their mistakes. It was really disappointing and frustrating to lose to them, especially coming in to it since we though we were going to win. So I think we just came in too confident.” Garcia said. Head coach Johnathan Penberthy believes the team underestimated the Cowgirls. For more sports read the World of Sports: Why the Royals will win the MLB World Series. The Eagles played the Parlier Panthers at home, Oct. 13. FC was looking for forward to winning their first league match. Also, please be sure to check out the Eagles’ schedule for the upcoming season at Max Preps. FC is currently 13-8 overall and 1-3 in the Central Sierra League as of Oct. 16. FC’s next game will be on Oct. 9, as the Eagles play a home game against Riverdale High School. In the first set the Eagles came out focused and confident, beating the Panthers 25-6. The Panthers managed to get a run on the Eagles in the second set, however they were unable to muster the strength to beat the determined Eagles who kept the score at a modest 25-14. With two victorious sets under their belt, the Eagles decided to switch up the line up and allow players to play foreign positions. Despite the numerous lie up mistakes, the Eagles managed to seal the deal, 25-16. Senior Ivette Ibarra, admits to feeling immense pressure to becoming the teams’ setter in the third set. Head coach Johnathan Penberthy enjoyed watching the team have fun and play well to achieve their fist league victory. 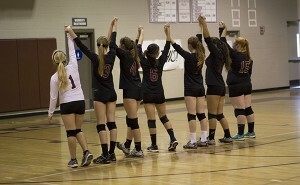 The Eagles next home game is Tuesday, Oct. 21 at 5:30 p.m., against the Riverdale Cowgirls. Ward recalls admiring the high school cheerleaders and hoping to someday be just like them. 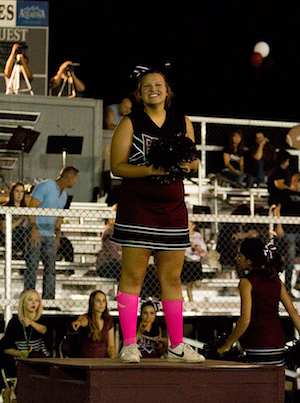 With an abundance of extra curricular activities to participate in, some choose art, others enjoy music but senior Kimberly Ward, loves cheer. Since the young age of five, Ward has never wavered in her love for it. Not only does is Ward a member of the FC cheer team, but also a member of the CenCal All-Star competition cheer team. She is a member of their ‘Inferno’ team which consists of cheerleaders in level 4.2. Ward began competition cheer at five years of age and continued with it for two or three years, however, she quit and re-joined last year in 2013. Ward identifies the differences between the FC team and CenCal. Flyer for Ward’s stunt group at FC and best friend, Callista Fries, ’15, has immense trust in Ward and is unable to imagine cheer without her. High school is the time to make unforgettable memories with friends, and participating in two cheer teams will not stop Ward from spending time with her friends. Despite cheer being that most dangerous female sport and number two in catastrophic when compared to all spots, Ward has not suffered from any cheer related injuries. However, she is able to recall her scariest cheer moment. Ward also will never forget the memories and accomplishments that cheer has brought, including her top cheer moment to date at the Jamz Nationals. This writer can be reached via Twitter: @gaby_siqueiros. Follow The Feather via Twitter: @thefeather. For more sports, read the Oct. 17 article, Volleyball sport short: Minarets. The worship team gathers together to lead worship at SYATP. On Sept. 24, students around the nation gather in prayer for their communities, schools, teachers, friends and families. 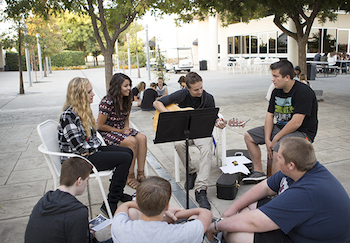 FC students met in the quad at 7 a.m. for prayer and worship at the annual See You At The Pole (SYATP) event. The SYATP event started in 1990 by a small group of students in Texas, and gradually increased in popularity. Currently there are more than three million students that participate in SYATP. The event was created with the intent that students would organize, plan and lead it. The 2014 theme verse for the event which speaks about the armor of Christ, to stand tall and share the love of Christ. The SYATP hash tag was #neverstoppraying, encouraging students all over the world that no matter what day it is, to continuously pray, based on Ephesians 6:18. The early morning time prevented some students from attending; however those that did participated in a unified worship time, then split up into small groups to pray for various things. Sophomore Sydney Belmont has participated in SYATP for two years and enjoys that the school is able to come together and pray about everything. Senior Collin Winegarden led worship during SYATP and admits to being nervous beforehand. Freshmen and first time attendant, Celeste Counts enjoyed watching the school unify and pray together. Leadership Adviser Vickey Belmont recently lost her father-in-law and found that SYATP was a very healing experience. For more features, read Sept. 23 article Guest speaker tells story, delivers powerful message. With homecoming on the way, Oct. 31, the class has begun planning out the various pageants that the homecoming court will participate in. Student leadership is taking a more active role in promoting student involvement this school year. Please return to read about how FC students are actively learning, serving and promoting teen events on and off campus in this weekly article series. The leadership class has invested in The Anatomy of a Disciple by Dr. Rick Taylor. Students continue to learn about what it means to be a disciple and how they can be true disciples of Christ in the modern world. With homecoming on the way, Oct. 31, the class has begun planning out the various pageants that the homecoming court will participate in. Dress up days have already been established and will be revealed to the student body within the next two weeks. Both volleyball games will be away this week, on Tues. the team will travel to play Summit Charter Collegiate Academy in Portervile and only the varsity team will travel to Alpaugh to play Alpaugh high school, Oct. 2. The next leadership class meeting will be held on Tues., Sept. 30 to continue to plan the festivities of homecoming week and preparation for Grandparent’s Day, Oct.3 from 8 a.m.- 12:25 p.m.
Grandparents are welcome to sit in on their grandchild’s classes and a luncheon will be held to celebrate the grandparents that attend. Shuttle services will be available in parking lots ‘A’ and ‘F’. Leadership students will also help in setting up and serving dinner for Isabel Anderson’s masquerade dinner, Oct. 4 at 5 p.m. in the FC gym. Anderson was diagnosed with a rare case of brain cancer and has gone through six weeks of radiation treatment. The purpose of the dinner is to raise money for the Anderson family. Anyone is welcome to attend and those who cannot are free to donate to the organization. The next home football game will be next Friday, Oct. 10 against Kings Christain. Make sure to come out and support your Eagles! Follow The Feather and leadership via Twitter: @thefeather, @vbelmont3. This writer can be reached via Twitter: @gaby_siqueiros. Student leadership will host a rally in the FC gym at 2:30 p.m. to raise school spirit in honor of the football game, Sept.
Student leadership will host a rally in the FC gym at 2:30 p.m. to raise school spirit in honor of the football game, Sept. 5. The theme will be The Teenage Mutant Ninja Turtles (TMNT). Class colors are as follows: seniors wear red, juniors wear blue, sophomores wear purple, freshmen wear orange. In order to celebrate the result of the first home football game of the season against Coast Union High School, student leadership will hold a 5th quarter in the PC gym. Admission is $4 for students, $8 for non-students and free for the football players. This includes pizza, candy, drinks and volleyball. Freshmen Erin Wilson anticipates her first high school rally as a high school student. Morgan Miller, ’16, likes the new location of 5th quarter because of the proximity. Leadership advisor, Vickey Belmont, shares the new features 5th quarter has to offer. For more new, read Aug. 29 article, Student Leadership: Speaks out. The girl’s team is made up of six players. The top four players on the tennis play singles, and fifth and sixth play doubles. With the absence of the girls tennis team for the past few years, girls were either forced to abstain from the sport altogether or play on the boy’s team in the spring. The girl’s team is made up of six players. The top four players on the tennis play singles, and fifth and sixth play doubles. Their first game took place at FC against Coalinga, Aug, 28. They lost the match as a whole losing both singles and doubles. The Lady Eagles are scheduled to play their next game against the Caruthers Blue Raiders at home, Sept. 2. And will play against Avenal at home as well, Sept. 4. Sophomore Karagin Udall played junior high tennis and has kept up her skills through various camps and is excited to be a member of the new tennis team. Athletic Director Michael Fuller looks forward to the wider variety of athletics that girl’s tennis will provide. For more sports, read the Aug.28, Volleyball sport shorts: Immanuel. Jared Kaiser joins the FC campus as new math teacher. With a new year change has begun, goodbyes have been said to last years teachers, and a new hello has been circulating school wide for new fresh faced teachers. New math teacher Jared Kaiser takes on his first year of teaching at FC, but coached basketball and taught math for Parlier high school last year. Kaiser grew up in Lake Forest, CA and attended El Torro high school. He later went on to play basketball for four years at Chapman University and majored in accounting. Kaiser is not exactly a new name around FC, his wife, Jordana Siebert was the history teacher for two years, from 2011-2013. Jared admits to feeling strange about coming to a school his wife previously taught at. Kaiser finds FC parents to be much more involved in both the school as a whole and in their children’s academics. 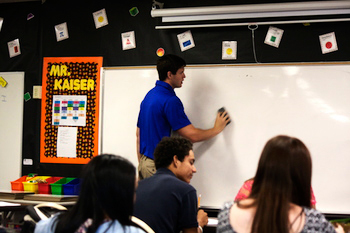 With a whole math department and multiple teachers, teaching the same class, Kaiser felt able to rely on them for any questions about the curriculum. Kaiser is very grateful to Director of academics, Michael Fenton for creating an outstanding mathematics curriculum. 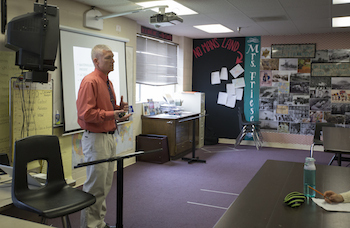 Every job has it’s difficulties, and Kaiser says that he finds the hardest part about being a teacher to be the constant preparation and creativity needed to keep students interested and invested in their work. Senior Brooke Wood enjoys Kaiser’s class for the atmosphere he provides to the classroom. Amber Wilson, sophomore, has taken a great liking to Kaiser’s hands on approach to his teaching curriculum. For more features, read the Aug. 28 article Devices promote class efficiency, productivity. The goal of the retreat is to bring students closer together and to create new friendships. Night hikes, team challenges and campfire worship are all activities designed to make students work together and learn to collaborate with one another. As students launch into their last year of high school, an event which many highly anticipate is the annual senior retreat which will be held at Calvin Crest, Aug. 16-17. History teacher and chaperone Kori Friesen looks forward to watching relationships grow and blossom. “I’m really looking forward to having lots of fun with the seniors, I didn’t get to go last year so this year is going to be new to me.” Friesen said. Although the senior retreat is somewhat of a mystery to some, senior Summer Villanueba looks forward to spending time with her classmates outside of the traditional classroom setting. While most students will attend, some will not be able to due to prior commitments. Students depart from FC at 10 a.m., Aug. 27, and will arrive back at FC around 2 p.m., the next day. For more news articles, read Aug 13 article: 2014-’15 convocation brings excitement, sets goals. I love FC. I love the condensed environment, the caring teachers and especially the close relationships I am able to create with so many people. Yes, FC is small, but imagine how well you get to know everyone. Eventually you get comfortable with a variety of people and can easily open up about anything. I am aware that not every single person at FC is is kind and caring; some people will hurt and abandon you, but that’s just the reality of school. Another great aspect of attending a small school is that people are given the opportunity to participate in a multitude of activities: sports, clubs and independent classes. And so you know the best part? The teachers and coaches are willing to be flexible in order to help you manage your extra curricular activities. And can I just say how great our teachers and faculty are? I mean they give up so much of their time and effort to put up with high school students all day, and I assure you that they do not put themselves through that for the money?. The teachers here are willing to do what it takes to make our high school experience rememberable and worth the time we put in to it. I have made so many good relationships since coming to FC in the seventh grade, some instantly, others over the course of the years. Either way I am so grateful that I can surround myself with a variety of great people. I know that I can count on them to pray for me and be there while I go through the teen struggles. I often hear so many people talk down on the school saying it’s “too small”, “boring, or “not fun”, but guys, IT IS WHAT YOU MAKE IT. You want more excitement at games? How about you show up and be that person who stands up in the nut house and starts the chants. Think it’s too small? Talk it up and then maybe more people will look into coming. Not fun? Make it fun, be crazy, have fun, love God. With the school year coming to the end, seniors begin to look back on all the years of high school and the memories that came with them. Students are usually recognized for their dedication both in academics and athletics; however, some have been able to avoid the spotlight even though they have been involved in so much this year. A perfect example of this is senior Aliciana Quintana. While being cast as the leading lady in our schools first musical, Bye Bye Birdie, she was invited to the California CIF State Meet for Cross Country, an honor only a few high school students receive. Her favorite memory of this year however, is performing Bye Bye Birdie with her fellow classmates. ?Although I had such a blast with everyone during my time in cross country, nothing could beat Bye Bye Birdie,? Quintana said. ?The fact that we pulled off such a difficult musical in such a short amount of time is amazing and I was so blessed to be apart of it.? Although Quintana was a big part of drama class by being a lead in the spring production, sports was also a huge part of her high school experience. ?I?ve been in track every year and I?ve done cross country during sophomore year and this year,? Quintana said. ?Getting to spend so much time with my teammates was awesome and some of my favorite memories of high school have been from those sports. Quintana will be staying in Fresno after graduation and will attend Willow International. Though she is excited about graduating, she will miss the campus atmosphere. ?So many people complain about our school, saying it?s too strict and things like that, but I love it,? Quintana said. ?Where else could you become so close with your classmates and teachers like we can here? We became a big family over these four years of high school and I will dearly miss it.? Being a lifer at Fresno Christian, Quintana knows this school inside and out, so she hopes that she can pass on some knowledge that she has gained over the years to some of the younger students. ?Being at Fresno Christian allows you to get involved, unlike other schools where there is so many people that it?s too difficult to even try out for something, like music or sports,? Quintana said. ?Take advantage of this, go out for sports, join drama or choir class, have fun, get out there and be apart of the school.? This writer can be reached via Twitter: @Robbie_J24. Follow The Feather via Twitter: @thefeather. For more features, read the May 7 Food, entertainment adds lively atmosphere to Cinco de Mayo article. This is the 35th episode of “FC Underground, 2013-14” covering the week of May 5, 2014. Junior Callista Fries is a second year host and broadcasts the video news alone. FC Underground is a weekly segment hosted by Fries, filmed and produced by Senior videographer Jared Franz. Monday: Golf has a match at Riverdale. Softball has a home game starting at 4:00. Tuesday: Baseball has a home game, starting at 4:00. Wednesday: Track has a meet at Coalinga starting at 2:00. Thursday: Softball has a home game starting at 4:00. Friday: Baseball has a home game starting at 4:00. 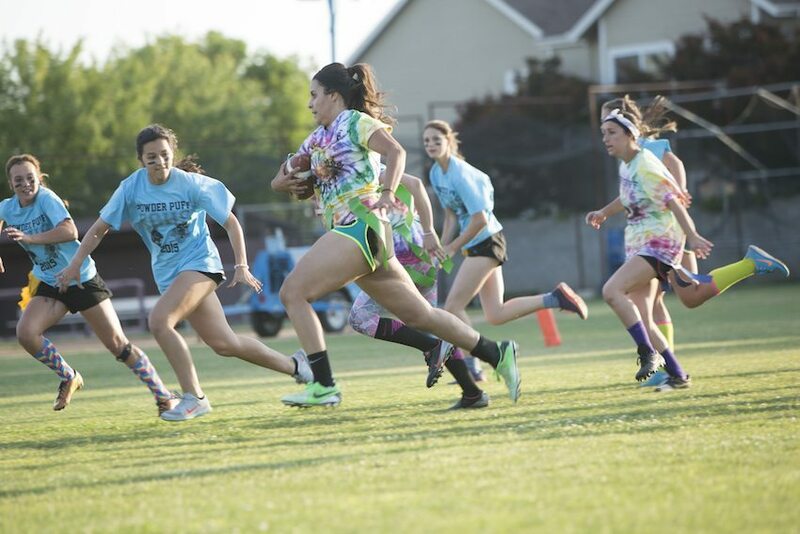 Fri. May 9, there is Powder Puff starting at 6:30 p.m.
For these and other events, read The Feather Online announcements at the Daily News on the right menu bar. The FC Underground segments consist of news, interviews, profiles and comments on campus life. Each episode is between two and three minutes in length. “FC Underground” first ran in the fall of 1997 and continued until the spring of 2001. In the fall of 2009, editor-in-chief Suzanna Quiring , ’10, resumed the series, which was then produced by Paige Powell, ’10. After Quiring and Powell graduated, Brooke Stobbe and David Casuga took up the job until the end the 2011-’12 school year. Now, Fries and usually senior Jared Franz have continued the segments. The San Joaquin River Parkway hosted a small variety of authentic food truck cuisine May 4 from 11 a.m.- 3 p.m. The event included an artisan market, a used sporting goods sale and eight food trucks in hopes of attracting people and families to the parkway. Participating food trucks are as follows: Dusty Buns, Ooh De Lolli Ice Pops, Casa De Tamales, Summertime Pies, Eat Street Bistro, Mattie’s Pizza, Benediction and TakoBBQ. Candy Barnes, San Joaquin River Parkway Trust board of directors, enjoys the food truck events because it promotes their venue. Barnes also believes that everyone likes food trucks events. The San Joaquin River Parkways, hope to build a parkway on the Fresno side of the San Joaquin river from Friant Dam to Highway 99. Donna Mott, owner of Ooh-De-Lollie Ice Pops, is a regular vendor at the food truck event. After attending last year, Bill Huene, favors the set up this than in pervious years. For more features, read the April 29 article Misleading nutrition labels prompt changes. These writers can be reached via Twitter: @_sarapeterson and @gaby_siqueiros. Follow The Feather via Twitter: @thefeather. This is the 34th episode of “FC Underground, 2013-14” covering the week of April 28-May 2, 2014. Junior Callista Fries is a second year host and broadcasts the video news alone. FC Underground is a weekly segment hosted by Fries, filmed and produced by Senior videographer Jared Franz. Sister to Sister has an off campus lunch on Mon. April 28. Debate Team meets every Wed. during 4th period in room 628. The annual FC Powder Puff football game will be held on the FC north field at 6:30 p.m. on Friday, May 9. Each grade will assemble a team of girls which will participate in a game of flag football against other classes. The first round will consist of seniors against freshman and juniors versus sophomores. The second and final round will be the winners playing against each other and the losing teams will compete against one another. At the end the champions will receive a trophy for their victory. Senior Katie Uribe has yet to participate in Powder Puff and looks forward to the upcoming games. Sophomore Alexis Kalugin feels that it was a mistake to miss powderpuff last year and is looking forward to trying it out this year. Freshmen Powder Puff coach Julian Castro is hopeful about the upcoming games and pleased with the positive feedback from his class. Junior Powder Puff quarterback Ivette Ibarra is excited for the competition and hoping for a three-peat. These writers can be reached via Twitter: @_sarapeterson @gaby_siqueiros. Follow The Feather via Twitter: @thefeather. 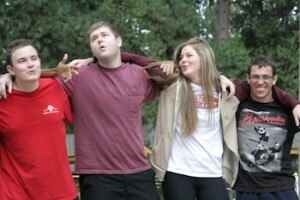 For more news, read the April 22 article, BreakAway challenges students to service. Throughout the nation, physical education classes participate in Presidential Physical Fitness Testing, to test their physical abilities. Students showcase their physical abilities through a series of tests and receive a grade based on their scores. The test includes activities such as: hands release push ups, sit-ups, squats, sit and reach and the mile. Each test has a certain number of repetitions in order to pass, receive a higher score. Student who pass all of the five fitness test will receive a certificate. those who are in the 80 percent and higher percentile for all five events will receive a medal. Ericlee Gilmore physical education teacher assess all of his student, junior high and high school, with the same test. “Physical fitness testing is a national test, and I decided to it April 2-8 because it was right around the time of SAT-10 testing. So we can test the brain along with our bodies,” Gilmore said. “I test my junior high and high school students on the same things, there are just different standards for each. Gilmore develops the test requirements by averaging the total skill level of each grade. Junior Alyssa Oakley, believes participating in fitness testing is important for students, but they should practice each of the tests before hand. Chloe Mueller, ’16, enjoys testing her physical abilities and setting goals for herself. 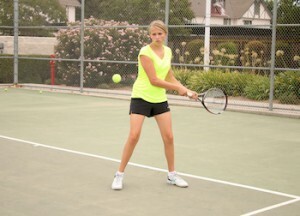 For more sports, read the April 2 article, Boys tennis sport shorts: Caruthers. Spring sports photos will be held at 3:15 p.m. in the FC Gym for both high school and junior high students, April 8. Photos will be taken by Milne Photography after school as not to disrupt classes. Sports picture order forms can be found here, in order to view the form you must sign in to your gmail account. For more news, read the April 2 article, Fresno to move forward with aquarium project. Malayan tigers are typically found in southern and central Malaysian Peninsula. Their life span is about 15 years in the wild and up 20 years in captivity. The Fresno Chaffee Zoo has recently added a unique element to the tiger exhibits on display. 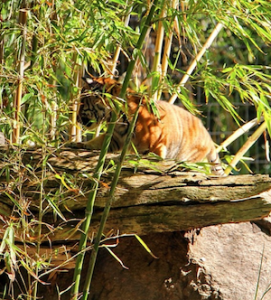 In addition to the recent improvements, Malayan tiger cubs have recently made their appearance to the public. Malayan tigers are typically found in southern and central Malaysian Peninsula. Their life span is about 15 years in the wild and up 20 years in captivity. Their population estimate as of 2008 is 489-1480; they are considered an endangered species. The common Malayan tigers diet consists of Sambar deer, wild boar and bearded pigs. The average weight of both female and male tigers range from 176-330 pounds, with a height of 6.5-7.8 feet. Lead mammal keeper at the Chaffee Zoo, Sarah Shearer, shares the zoos concerns about showcasing the cubs on exhibit. The zoo takes part in the Malayan Tiger Survival Plan, Shearer provides insight to the participation of the plan. The female Malayan tiger, Mek, mother of the four cubs has been able to raise the cubs on her own with little interference from the zoos staff. Shearer explains the reasoning behind their decision to let the cubs grow up to be wild cats. Whether it be hands-on contact with the cubs or watching from a distance, Shearer thoroughly enjoys watching the cubs grow up. Follow The Feather via Twitter and Instagram: @thefeather and @thefeatheronline. This writer can be reached via Twitter: @sarapeterson , _gaby_siqueiros. For more features, read the March 31 article, Music department prepares for end of the year concerts. With two days under their belt, day three in New York proved to be just as scholastic as it was entertaining. Some editors were chosen to teach classes at the Columbia Scholastic Press Association Spring Convention at Columbia University with the help of journalism advisor Greg Stobbe. The day started off early in the morning with a quick breakfast and a trip on the subway to Columbia University. Multi-media anchor Callista Fries and Sports Editor Christopher Grossman taught the first class, ‘Broadcast Your Voice,’ instructing attendees on how to create a podcast and tips on how to stay focused. Next, Editor-in-Chief Tynin Fries and Senior Editor Viviana Hinajosa taught the second class, ‘Online Workflow,’ helping advisors and students find a good motivation to get work done as well as share how The Feather came to be successful. Following the Columbia experience for the first time this week the group headed to The Cathedral of St. Johns the Divine , a famous old gothic European cathedral. The group took a vertical tour of the largest cathedral and had the opportunity to see the New York City from the roof. The group then ate a quick dinner around Times Square and went back to their rooms to freshen up for Disney’s Newsies Broadway show later in the evening. The trip back to the room proved to be an adventure due to the fact that it poured rain and the streets were mildly flooded. Upon their return to the hotel, the staffers separated to their room and went to sleep to rest up for the next day. Follow The Feather via Twitter: @thefeather. These writers can be reached via Twitter: @_sarapeterson and @gaby_siqueiros. For more news, read the March 18 article, Feather in The City, Day 2 (38 PHOTOS, VIDEO). After a full night’s rest and the first day of the group’s endeavors in the Big Apple, they held high hopes for the new full day and what it offered. To start off the morning they began their walking tour through Times Square to Bryant Park located next to the New York Public Library. From there the group visited the famous Grand Central Station which contained an underground shopping mall and fresh market. Next up was the New York Public Library famous for its architecture/ceiling, which attracts many directors to shoot movies there. For lunch the group was allowed to venture out into Rockefeller Center to shop and find something to eat. Once in the Rockefeller Center, the group took a tour of Radio City Music Hall and interviewed a Rockette. Multimedia Anchor Callista Fries, ’15, veteran to the trip, enjoyed touring the Radio City Music Hall even after having already done it before. Before dinner the group was permitted to walk around SoHo and Little Italy and shop while waiting for an early dinner at La Nonna before heading back to the hotel to dress for the Broadway show. To finish off the night, the group attended Les Miserables, a top Broadway show. German foreign exchange student Patrick Schmitt, guest to the journalism staff and hosted by staffer Ethan Andrews, has enjoyed his time in New York, especially taking notice of the Les Miserables Broadway show. Follow The Feather via twitter: @thefeather. These writers can be reached via twitter: @_sarapeterson @gaby_siqueiros. Often in life high school students find themselves searching for a place to belong, and in a small school like FC, sports are a constructive and fun way to find themselves. Junior Dillon Owens discovered his love for baseball early on in life and has continued playing throughout all of middle school and high school. His determination to be the best he can be has driven him to great lengths in the sport. In his many years in the sport, Owens remembers some of the greatest and most embarrassing moments in his baseball career. Unlike many high school students Owens gets the privilege of being able to play alongside his cousin Tyler Sellers, ’16. Sellers also enjoys being able to count on his cousin out on the field, knowing from experience the two play well together. This year, Owens has set goals for himself personally as well as for the team, ultimately hopeing to advance the team to playoffs. Head baseball coach Noah Heinz admires Owens’s passion for the game and has high hopes for the team this year under his leadership. For more sports, read the March 14 article, Softball sport shorts: Orange Cove. With the future rapidly approaching many students have decided to get serious and figure out possible occupations, according to their interests. To help students expand their knowledge of future careers, the third annual Career Day was held, March 12. Students were to attend three sessions, they chose one speaker at each available session to learn about each career. The goal of Career Day was to inform students of possible career choices. Guest speakers ranged from business men, architects, physicians and many more. History teacher Kori Friesen, instructed students on what it takes to be a photographer and run a business. Sophomore Sierra Duffy was surprised at the interest she took in photography and is grateful for the opportunity of Career Day. Tyler Breedlove, ’16, explains his understanding of Career Day and his appreciation for the careers selected to present. He believes having that type of event truly benefits high school students. Anesthesiologist Ty Hutchins, one of the Career Day speakers, explained the journey he took to enter the profession and a description of what his job entails. Junior Brooke Wood attended the career fair and thought it was very beneficial for students to take part in. Hutchins gave insight into some of the difficulties and benefits that come from his profession. He loves the work he does, but also struggles with the lack of sleep that comes with it. Hutchins recommends that students looking to pursue Anesthesia be able to keep up with the everyday stresses of the job. Senior Rayna Endicott found Career Day to be very insightful for the career sessions she attended. She appreciated the advice given to her from the different speakers as well as the fair that was held afterwards. For more features, read the March 7 article, School-wide service day benefits local organizations (VIDEO). With the many changes brought about by the Bring Your Own Device (BYOD) program, the FC Technology Leadership Team is putting on a Technology Information Night in the FC music suite, March 10 at 7 p.m.
Technology Information Night will serve as a guidance to parents for the vision of BYOD. Head of technology department David Martens, wants parents to understand the plan of BYOD. Parents are encouraged to attend in order to clear up any confusion or concerns they may have regarding the technology transition. History teacher, Kori Friesen explains how crucial it is for parents to be on board and support the new change. Friesen hopes that the information night will shed some light to the new BYOD program. She hopes that it will calm the fears of the hesitant parents and allow them to realize that the school needs as much support from them as possible. For more news, read the Feb. 4, BRIEF: Fundraiser to be held at Applebee’s, March 10 article. In just a few short days, the drama department will make FC history by producing the first ever musical, Bye Bye Birdie with an added bonus of a live orchestra. Performance days will be Friday, March 8, at 1 p.m. and 7 p.m., Saturday, March 9, at 7 p.m. and Sunday at 4 p.m. Tickets are on sale in the high school office for $10 and $5 for students, seniors and military. Tickets will also be on sale at the door on performance nights. Bye Bye Birdie is set in the 1950s and was inspired by Elvis Presley and his draft notice into the army. The story also revolves around the life of a music producer and and his struggles. The production will have added value of a live orchestra to play for all the musical numbers. Music Director Michael Ogdon is pleased with the progression into a more advanced drama performance. Drummer Trevor Trevino, ’17, looks forward to the upcoming performances and seeing everything come together on stage. The orchestra has also brought in a few other people with different musical skills and instruments played in hopes of adding even more sound and detail into the music. Junior Madison Seib enjoys performing with drama and is excited to see everything come together in the end. Senior Natalie Ruiz gives insight on what its like to act with a live orchestra. For more features, read the March 4 Campus, community collaborate for Kids Day cause article. The purpose of the auction is to raise as much money for the school as possible and to raise awareness in the community. Save the date for the Fresno Christian’s 31st annual auction on March 15, which will be hosted in the FC gym from 5:30-9 p.m. The night will consist of both silent and live auction segments. The silent auction will consist of gift certificates, services and desserts. Steak dinner will be served at 6:30 followed by the live auction at 7:30. Executive Director of Christian Business Men’s Connection (CBMC), Tom Sommers will be the night’s guest emcee. The purpose of the auction is to raise as much money for the school as possible and to raise awareness in the community. The 2014 goal is 100K, $10,000 more than the 2013 event. Superintendent Debbie Siebert raves at the student involvement and their key part in the success of the night. Siebert encourages all students to help at the action by setting up or donating items to be auctioned off. Junior Aaron DeWolf helped with the auction last year and provides insight on his tasks. Siebert explains her role in the auction as being apart of the auction committee. After multiple successful years, Siebert wants to raise 100K for the school, since this will be her final year as superintendent of FC. These writers can be reached via twitter: @_sarapeterson @gaby_siqueiros. 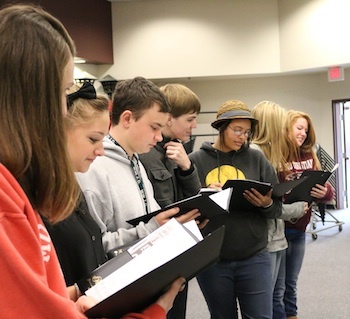 For more news, read the Feb. 27 article, Campus choral department hosts festival. Juniors Sara Peterson and Gabriela Siqueiros chose to interview Japanese internment survivor Diane Kanzaki-Reeves as part of their oral presentation after reading Jeanne Wakatsuki’s novel, Farewell to Manzanar. The following is part of Peterson’s and Siqueiros’ research and presentation of the Japanese internment after the bombing of Pearl Harbor. They relate Wakatsuki’s Manzanar experience to that of Reeves. During World War II (WWII), war time hysteria affected many minority groups that resided in the United States. Anxiety increased tremendously in the west after the Japanese bombing of Pearl Harbor, Dec. 7, 1941. Many believed that any person with Japanese decent was in contact with the government overseas and conspiring against America. In hopes of protecting the nation, president Franklin D. Roosevelt approved Executive Order 9066, Feb. 19, 1942. The act forced more than 127,000 Japanese American and immigrants in the west to government made internment camps. Loyal and honorable Japanese Americans were angry and confused at the sudden hostility and fear everyone had towards them. Diane Kanzaki Reeves, former internee, recalls the fear her parents felt when Executive order 9066 was enforced. When the govenrnment split up the Japanese Americans into camps, they commonly went by addresses. Many Japanese internment camps were located in the California and Arizona deserts. Other camps were spread throughout the rest of the western United States. For most, the ride from everything they had known was the hardest part due to their lack of knowledge on the camps, and what would await them there. Reeves recalls being shoved into the cattle cars with hundreds of others. Most Japanese-Americans would agree that the camps were incredibly degrading and unlawful, but some did not find the camps as bad. Although, they all agreed on one thing: the camps took away their freedom and broke their constitutional rights. Every camp was in a different condition than the next. In most camps the Japanese-Americans were forced to live in very small barracks with many people in each one. Reeves clearly remembers her living quarters in the internment camps. As time went on families were forced to adapt to their new way of living and make the best of their situation. Many used the term, “Shikata Ga Nai,” which means “it cannot be helped.” Reeves recollects the tight schedule they were put under. Although most of the Japanese Americans imprisoned in the internment camps did not enjoy their time, Reeves and her family tried to make the best out of their experiences. To occupy their time in Tuke Lake CA, the internees would make art out of the scraps they found. Farewell to Manzanar, by Jeanne Watasuki Houston, vividly describes her time spent in the internment camps. She recalls her living condition, the food served, latrines and emotional toll that living in the camps had on her family. Houston also recognizes what her mother did for their family and the toll it took to stay strong for the sake of everyone else. The following is an excerpt from Houston’s novel Farewell to Manzanar. “[Mama] would quickly subordinate her own desires to those of the family or the community, because she knew cooperation was the only way to survive. At the same time she placed a high premium on personal privacy, respected it in others and insisted upon it for herself. ? Almost everyone at Manzanar had inherited this pair of traits from the generations before them who had learned to live in a small, crowded country like Japan.? Although their time in the camps were up, the hard times endured in the camps still had long term affects on Reeves and her family. Reeves currently lives in the same house her family lived in following their camp experiences. For more related articles, read the 2013 Feb. 22 article, Kawashima recalls internment camp experience (VIDEO, PODCAST) or the 2012 May 18 article, Fibber recalls life in Arizona internment camp (VIDEO). These writers can be reached via Twitter: @gaby_siqueiros @_sarapeterson. Follow The Feather via Twitter: @thefeather. For more features, read the Feb. 5, FC increases technology use, involvement. Each year during the months of January and February, with Night of the Stars (NOTS) just around the corner, boys begin the exciting and stressful task of asking girls to NOTS. 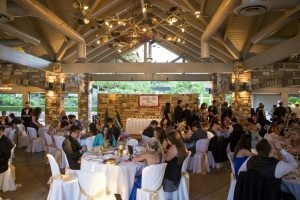 The event serves as the only formal occasion held for FC students, allowing people to take dates as well as going in a group. 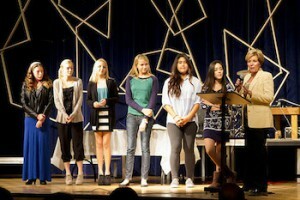 NOTS is an annual event that Student Leadership plans, and encourages all FC high school students to partake in. Each class has selected a movie to remake, that will be watched the night of NOTS. The night will consist of a dinner, showing of class movies and an award show. During the night there will be a drink bar and photo opp offered. With ever changing themes, Winter Wonderland has been chosen by student leadership as the NOTS theme this year. 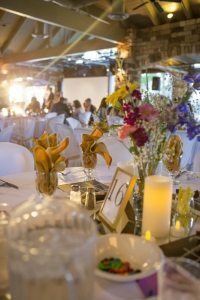 The event will take place at The Grand 1401, on the 10th floor, starting at 6:00 pm, with professional photos by Milne Photography at 5:30 p.m., Feb. 15. This year early bird tickets will be sold for $55, Jan, 13-24, and regular priced tickets will be sold for $60, Jan. 27 through Feb 14. The Feather wants to encourage students to submit their opinions about what they are excited for about NOTS, whether it be getting asked, watching the class movies or or just a good time with friends. I am not going to NOTS this year because I’m going to watch a soccer game with my brother that day. We’re going to watch LA Galaxy and San Jose Earthquakes at Chukchansi Park. If I were going to NOTS I think I would look forward to seeing all the movies that the classes made. THis year I got asked by Tyler Breedlove, after the JV basketball game he came out with some flowers and asked me. I kind of suspected he might ask me, but I didn’t know when. Im really looking forward to getting all dressed up and hanging out with all my friends that are going. I got asked by Dawson Triplett this year, he came into my english class and handed me a chocolate bar that he mad himself. It said ‘Will you go to NOTS with me?’ and it had the date on it. On the front it said ‘Worlds Finest Night’ instead of Worlds finest chocolate. It was really great. Im looking forward to all the movies that they are going to be showing. I was asked by Bobby. He took me on his dads airplane, and we flew over their property. Then his dad told us to look out of the right window, then he said to look out of the right window and Bobby had NOTS mowed into their lawn. Since it is my last year going to NOTS I’m looking forward to everything. This year I asked someone from a different school her name is Cierra Hamilton. I wanted to do something different to ask her, so i wrote her a song. This year I’m looking forward to the movies, because I think they are going to be really funny. I asked Sarah Lim, Annaleah took her to a building 5 to make some copies for Mr. Stobbe. While she was gone I had Mr. Stobbe and his fourth period freshmen english class hold up a sign and I hid in the middle of them. Then when Sarah came back in the classroom, I came out with flowers. I’m excited for the limo and hanging out with friends. I was asked by Taylor Crowger, he asked me at the first home varsity basketball game. He brought me a teddy bear and a rose and asked me in front of my friends. I am really excited to dress up, and see all the other pretty dresses. I asked Elora Hargis to NOTS this year by decorating her car with tons of post it notes, and on the windshield NOTS was written on it. I drove it into the quad during eighth period so that she would see it when she walked out after school. I’m really excited for everything about NOTS, I know it’s going to be a blast! I was asked by Kyle Hudecek this year, he basically came up to me when I was on my way the the gym first period, he came out of nowhere with Nyberg and some roses. I’m really looking forward to being with my friends, and it’s my first and last time going so I’m excited to see what it’s all about. I asked Rayna Endicott, Robbie Hill (Robbie asked Viviana) and I asked at the same time. We had a friend take a photo of Robbie and I with the signs and flowers. Then we had Rayna and Viviana pulled out of class to “help” us with a project. We had them take a photo of us, and then we said that we had to go upstairs and get Chris Grossman. While we were gone, Lucas Lopez took a photo of Rayna and Viviana, and when they looked at the picture, he pulled up the photo of Robbie and I, then we came out with a sign and flowers. I am not going to NOTS this year. Although I have gone to NOTS in previous years but I decided I would rather go to six flags with my boyfriend. I enjoyed NOTS, but I do not like to take the time to get dressed up, and I was not a fan of the food. I asked Ivette Ibarra. I got a couple of volunteers, and I duct taped the letters that spell out her name to them. Later when she came out to I had a sign and flowers for her. I thought that it would be cool to spell out her name, so I did that. I’m excited to go to NOTS because it is a lot of fun, and its not very stressful event. Last week I asked Kristina Muniz. I got her a Starbucks and had a sign that you pull apart, and it said, ‘NOTS 2014’ on it. I didn’t really know how to ask her. Later I asked my mom and she came up with the idea. I’m really excited for the class movies and hanging out with friends. I got asked by Philip Christopher this year, he asked me during halftime at the varsity basketball game. Robbie Hill came out and asked everyone to sing ‘happy birthday’ to him, afterwards he asked if he got all that he wanted for his birthday this year. He responded and said, “it’s been really good, but it’d be great if Claire Kollenkark went to NOTS with me.” I am looking forward to getting all dressed up and going with my friends in a limo, plus my date is pretty nice too. 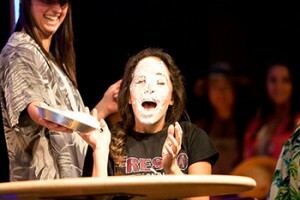 I asked Hannah Avila to NOTS this year, I asked her through a mission impossible video at chapel. I got the idea from my sister who asked someone to Sadies, so I took the idea and made it better. I am looking forward to having fun and hanging out with friends. I asked Callista Fries, I filled her locker with a whole bunch of Mr. Fenton’s ducks and when she opened it they all fell out and I came out holding flowers and a sign that said, “I’d be a lucky duck to go to NOTS with you”. I’m looking forward to seeing the class movies and all they hard work everyone put into making them. I got asked by Bailey Brogan at the rally today, he got three soccer players to hold up signs and he was right behind the with some flowers. I was completely surprised and embarrassed, however I am excited about getting to be with my friends on the night of, and laughing laughing at all the silly stuff that happens in the movies. I asked Aliciana Quintana in our Spanish class, I brought her flowers and asked her in front of the class, and she said yes. I am excited because this is my senior year and its my last time going to NOTS, and because this is my first year bringing someone from FC as my date. I asked Alli Breedlove. I had the cheer team hold up signs that spelled out her name, and on the back of the signs it spelled out NOTS. Then i walked out with a question mark, and some flowers. I’m excited for NOTS this year because this is my first time in leadership and I really like the theme this year. This is my first year going to NOTS, and I was asked by Matthew Tanaka. He asked me at the first basketball home game in the stands; he gave me a box of cupcakes. When I opened the box it said, ‘It would be sweet if you went to NOTS with me’ and each cupcake had a letter on it that spelled out NOTS. I am excited for NOTS because I am a freshman, and this is my first year going. This year I was asked to NOTS by Aaron Dewolf. I was coming down the stairs from english, and he tossed me a softball and it said ‘It’d be a steal if I could catch a date with you to NOTS’. I didn’t really know he was going to ask me, but I am excited that he did ask me. Sam Beyelia asked me to NOTS on Tuesday. I was at my locker and Sam walked up to me with flowers, a One Direction bag and a stuffed elephant and asked me to NOTS, of course I said yes. I’m really excited to go to NOTS this year, I’m looking forward to watching all the class movies and I don’t really know what our movie is about this year so it is going to be a surprise. I asked Kathryn Damschen. I pretended to be the principle because I play the principle in our NOTS movie, and had her called down to the office. When she walked into the office I asked her to NOTS and she said yes. I’m excited to go to NOTS because I want to see our class movie, its going to be awesome. This year I asked Chloe Mueller to NOTS. I brought her In n Out, and I had a sign that said ‘Are you in or out on going to NOTS with me?’ Since this is my first time going to NOTS I don’t really know what to expect, but I am excited for the food, and the junior and senior movies. For more features, read the Jan. 22 article, Harvard political philosopher presents morality in economics. Every year music director Michael Ogdon enters his all-star choir participants in the Fresno Madera Counties Music Educators Association honor choir. Every year music director Michael Ogdon enters his all-star choir participants in the Fresno Madera Counties Music Educators Association (FMCMEA) honor choir. Music directors from around the counties choose however many students they deem capable of participating on a different level of difficulty. The choir is given a very limited amount of time to learn ten songs that will be performed at the Paul Shaghoian Theater located at Clovis North at 7:00 p.m., Jan. 18. Ogdon sheds some light on the tasks of the honor choir, and the hard work that goes into the production. Appreciating that the event is local this year, Ogdon is happy to participate with his students. Rounding up to about 250, students from both public and private schools go to perform. Freshman, Katie Blankenship, expresses her excitement for the upcoming performance. She is also very grateful for being chosen as a part of the honor choir. Adam Loughney, ’14, was chosen for the first time this year, and found the honor choir was not exactly what he expected. Loughney was not too excited about the practices, but is looking forward to the performance. The FC participants are as follows: Adam Loughney, Josh Carter, Andrew Guthrie, Robbie Hill, Dalton Cowin, Jon Ago, Shannon Martens, Summer Villanueba, Elise Winegarden, Katie Blankenship,Maddie Luginbill, Natalie Ruiz,Amanda Menes, Illeana See. For more features, read the Jan. 16 article, Spanish Club focuses on community service.